Give your project a Package name. This time you will need to specify a reverse web style address…I’m choosing “com.mrcruwys.blackjackapp” because I have a website where I can put this app but you can just make up a unique reverse url address for yours. 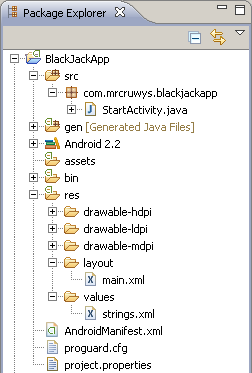 Create a start activity, I’m going to call mine “StartActivity” instead of “BlackJackAppActivity” simply because it makes more sense. Okay, now we need to test our app…this can be a bit of a pain in the neck!